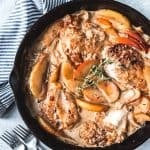 This Creamy Apple Cider Chicken Skillet is an easy, delicious Fall dinner with sweet and savory flavors. We loved this served with mashed red potatoes with the easy pan sauce spooned over the top. Pat the chicken dry with paper towels. In a shallow dish, season the flour with the salt and pepper. Dredge the chicken in the flour to lightly coat, shaking to remove excess flour, then set aside. Melt 2 tablespoons of the butter in a large skillet over medium heat. Add the sliced apples and onions and season with a little salt and pepper. Sprinkle with the fresh thyme. Cook for 8 to 10 minutes, stirring occasionally so that the apples and onions can soften and brown slightly. The apples should be al dente - not turned to mush but not to crisp still either. Transfer to a second plate and set aside. Add the remaining butter to the empty skillet along with the tablespoon of olive oil. Once the butter has melted, place the dredged chicken into the pan and cook over medium heat until lightly browned all over, about 2 minutes per side. Add the apple cider and broth to the pan and heat until boiling. Cover, reducing heat to medium-low and simmer until the chicken is cooked through to 160 degrees F on an instant-read meat thermometer, about 8 to 12 minutes depending on the thickness of the breasts. Return the apples and onions to the pan with the chicken and sauce. Add the cream and stir to combine. Increase the heat to medium-high and cook until the sauce has thickened slightly, about 2 minutes. Stir in the cider vinegar and adjust seasoning by adding salt and pepper to taste, if needed. Sprinkle with additional minced fresh thyme, if desired, then serve with the sauce, apples, and onions spooned over the chicken and mashed potatoes on the side.